Our favourite site for our boat trips from Corralejo on the 19th of October will be the exceptional setting for the XVI swimming crossing Isla de Lobos-Corralejo. The narrow channel separating these two points of the already traditional swimming crossing is known as “El Río”, a 3.400m-long channel of shallow waters (no deeper than 10m); the enrolment to this crossing opened last August 4th at ten in the morning and closed on October 1st. The participation is limited to 220 swimmers. The usual average time for this crossing is 65 minutes. 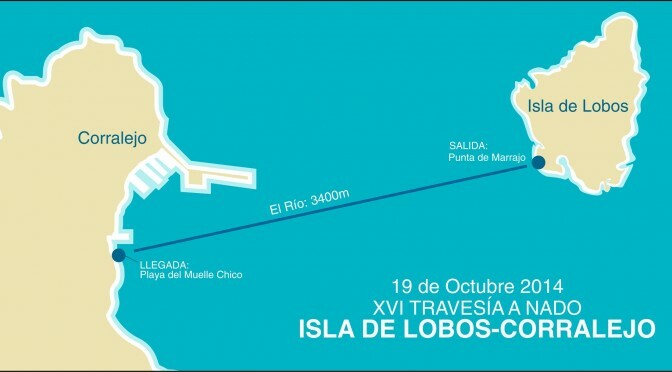 The starting point in the Isla de Lobos is in “Punta del Marrajo” at 12 p.m, and it will finish in “Playa del Muelle Chico”, Corralejo. 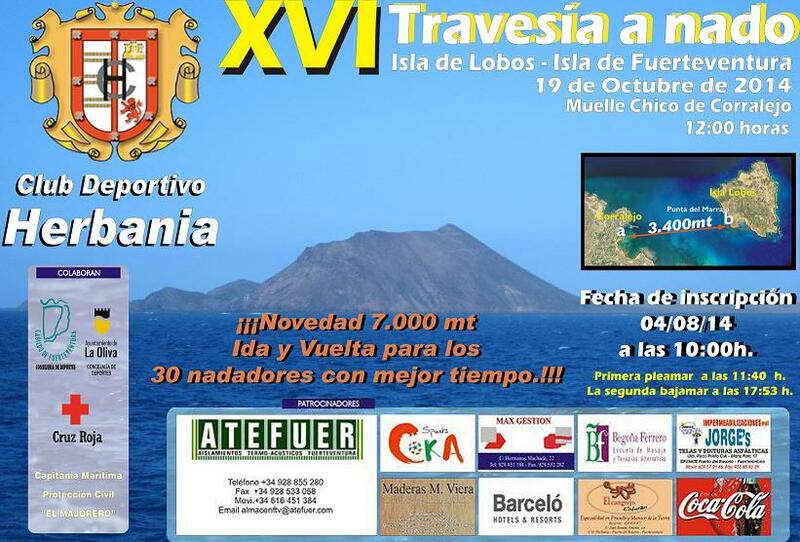 This event has been organized year after year by the “Club Deportivo Herbania”, and this year they are organizing the XVI event and it will be one of high difficulty as it will take place in an area with strong sea currents, so the swimmers taking part in it must be really experienced. This year the crossing presents a great innovation, extra difficulty that will make the event even more exciting. The thirty quickest swimmers will have the chance to perform a sweep-round, 7000m long. This event gathers amateurs and great swimmers that every year join it with the firm determination to reach the shore after overcoming the 3400m separating the two islands. Enrolments usually take place in the web C.D.Hebania or straight in the club’s office. Fuertecharter’s team is the exceptional spectator of this crossing as we cooperate with safety in this event supporting the swimmers with one of our boats; it’s a strong current area and we must take the necessary safety measures to make the event succeed. This event has lots of followers and the sweep-round novelty will make it even more exciting. We’ll be meeting in the water, good luck for all the participants, we’ll be supporting you.